Now here’s a story. 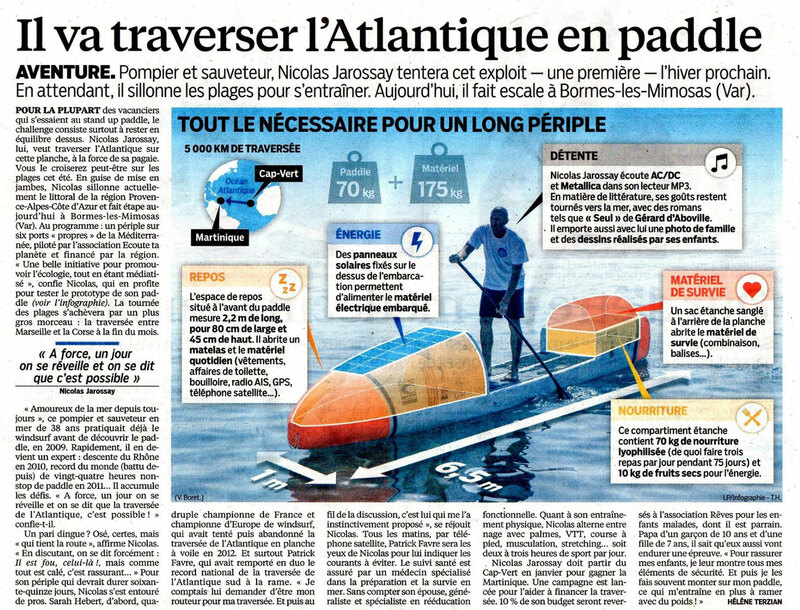 There’s this guy in France that wants to paddle across the Atlantic ocean. Totally unsupported. All 4,000 kilometres of it. That’s 2,485 miles, or in layman’s terms: A bloody long way. 38-year-old French paddler and firefighter Nicolas Jarossay plans to be the first person to cross the Atlantic Ocean on a stand up paddle board. And he’s going to do it without any assistance, paddling and sleeping on a specially designed “liveable” SUP board. 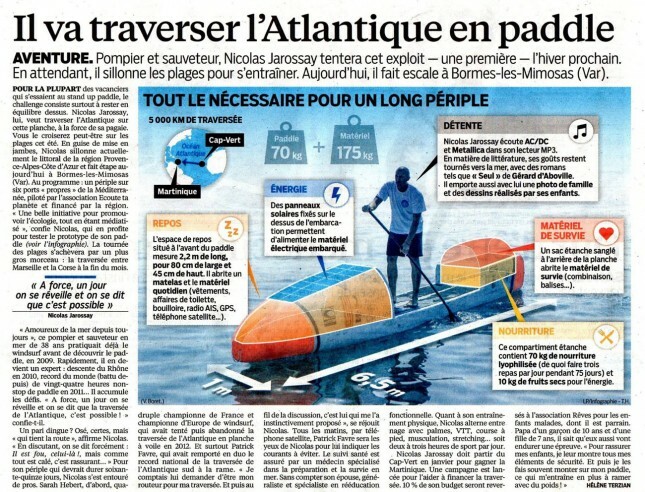 Nicolas, who already has a reputation in France for being a crazy marathon paddler, aims to make the crossing from Cape Verde, off the North-West coast of Africa, over to the French island of Martinique in the Caribbean. The voyage is expected to take 60-75 days and will begin January 2016. Everything about this adventure sounds amazingly ridiculously incredibly brilliant, including the board. Nicolas has a custom-built stand up paddle board that measures 20.8 feet in length (6.3 metres) and comes with a special pod on the front that doubles as his sleeping quarters. Kinda looks like what’d happen if the Starboard Ace married a ballistic missile. Anyway you can head over to TotalSUP for the full story, more photos and an interview with Nicolas (you can also help the guy raise the fifty grand he needs for the mission). 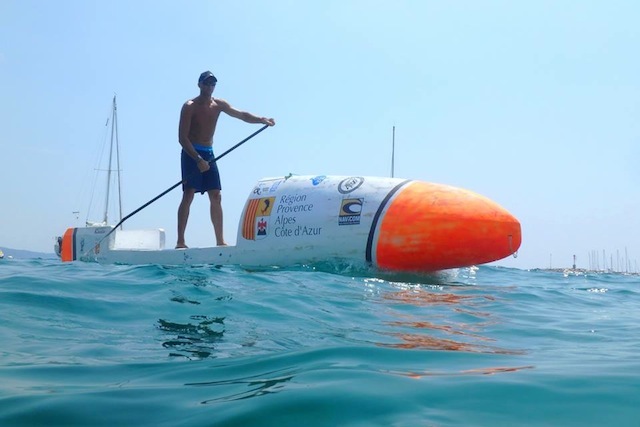 Though the Frenchman isn’t the only one eyeing a transatlantic SUP crossing. Chris Bertish, the wild man from South Africa, has been planning a similar adventure for a long time. Chris was hoping to be the first man to paddle across the Atlantic, however his voyage won’t begin until November 2016 (and won’t finish until April 2017), which gives Nicolas plenty of time to etch his name in the history books. The world’s other great SUP Crossing mad man, Bart de Zwart, once told me he’d also toyed with the idea of an Atlantic crossing. The Dutchman-turned-Maui-native eventually decided to pass, believing it was too time consuming and dangerous to pursue. We’ll find out if Bart was correct in six months, when Nicolas sets off on his incredible adventure.